I draw every portrait to order, from scratch, starting with a pencil sketch. I then finish everything by painting by hand, digitally – meaning I draw in the traditional sense, only using a graphics pen on a tablet, rather than a pencil or paints on paper. It starts with a pencil. First of all, I spend some time getting my ideas down on paper. These initial drawings allow me to explore the brief set out by my customer, which along with the photos they have given me, help me to map everything out, and decide what goes where. The first step of any commission involves me sketching up as many versions of an illustration as required (sometimes just one is adequate...other times it takes more attempts). This is a particularly important part of my design process. Once happy, I can then 'clean up' the version I like the best, and continue to work on it. Take a peep inside my "sketchbook" to see some more about my pencil drawings, here. Once I am happy with my sketches and have selected the best one to work on, I can use my scanner to scan it into my computer. From time to time, I tweak the drawing some more in Photoshop and use different bits of each sketch, to bring them together into a single file. Once I have deleted the white background of the scanned pencil sketch, it leaves me with a "layer" with a transparent background. Working in Photoshop, I can then use this template for the next step. 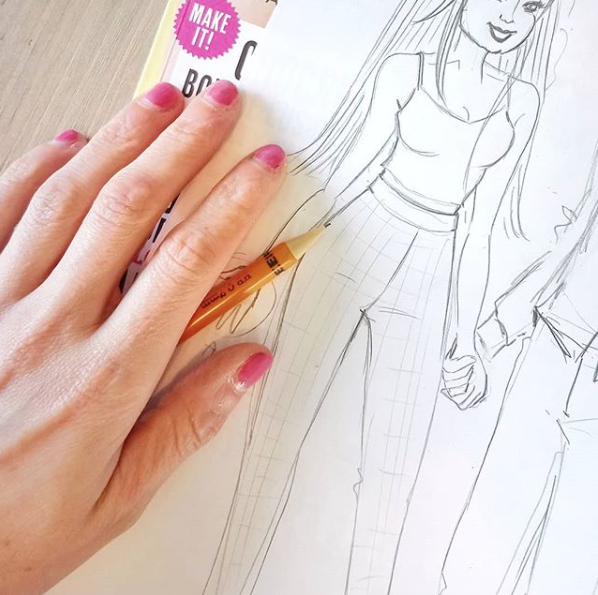 Using the "see-through" sketch layer I have drawn, I use it as a guide to re-draw and refine the portrait using my graphics tablem and pen (just as if I was drawing onto paper). I draw each individual element seperately (e.g. the bride's arm) as a stand-alone shape. I colour each one with a block colour and give it’s own layer, identifiable by an easy to recognise name e.g "left arm". This may or may not make sense, depending on how much knowledge of Photoshop you have...but from a technical point of view, I draw the 'paths' and then fill each one as a shape using the 'paint bucket' tool. After quite a lot of time I have re-drawn absolutely every part of the portrait as a seperate layer (from the "groom's left lepel", to his "shoe laces"), and I can then move on to my favoruite and main part of the illustration process. From left to right – pencil sketch, block colours, finished digital painting. time to paint. by hand, digitally. Now I have all the shapes, I work until the illustration is completed, to hand-paint on top of all the layers I have created, adding shading, pattern and texture to bring it to life. I work with 'brushes' that I have created (drawn originally with pencil on paper) to colour each section, adding tone and form along the way. I work through the drawing, refining any sections as I progress to keep the piece looking as I'd like it, whilst making constant reference to photographs my customer has given me. This stage is very much dictated by my original pencil sketch, but it never ever becomes a ‘paint-by-numbers’ scenario. 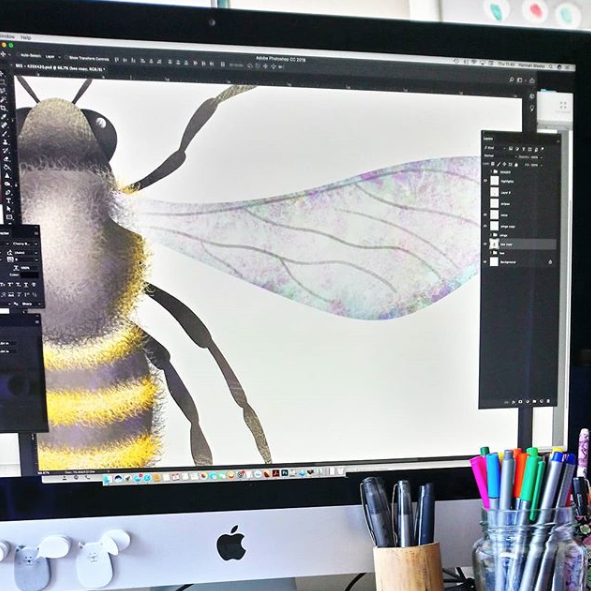 I never rely on the computer to do the work for me, as I see digital painting as just another medium, in the same way that coloured pencils or watercolour paints are. I relish spending the time working and re-working areas of my drawing as I go along, just as any artist working with a traditional medium would do. If an area doesn't look quite right, I draw over the top of it until it does. Once completely finished and approved by my customer, I send the image to print. Find out more about the printing options I can offer here, and the ordering process here. To place an order for your own illustrated wedding commission or family portrait, start by getting a quote by filling in my form. If you have any questions at all about my illustration process, please ask me any time.